The Cosmic Egg from whom all life has sprung, the beginning of all life, is the symbol of the Divine Female’s creative force. 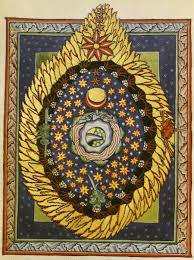 The Cosmic Egg represents the Cosmos, full of new life, promise and potential. This was described in the Rig Veda, the oldest Indian collection of Vedic Sanskrit hymns. 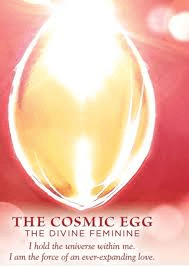 The Cosmic egg, as primal, creative force has also been described as Shakti, the female energy from which all things come. In ancient Egypt, the hieroglyph used for the Cosmic Egg was the same as that used to describe the child in her mother’s womb. 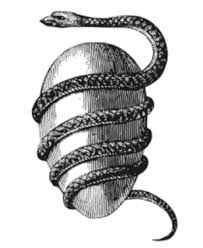 In ancient Greece, it was called the Orphic Egg. 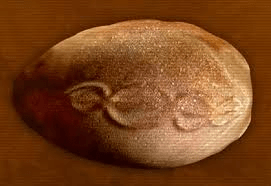 In the Lagos Museum, there is a 7,000 year old stone sculpture, six feet in length and imprinted with a symbol reminiscent of the strands of DNA; found in Silves, Algarve-Portugal, it was immediately named a “cosmic egg”. Creation always begins with an egg, the mother, the woman. The primal universe and/or the Great Mother who created it, took the form of an egg. Is it possible that the ancient tradition of coloring eggs for Easter in the spring is a way of paying homage to the Goddess and her womb – the Cosmic Egg? I would say, yes, absolutely.